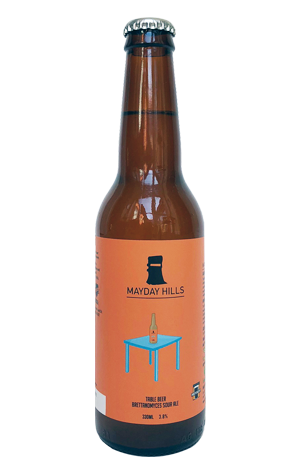 The releases from Bridge Road's Mayday Hills series – beers fermented with a strain of Brettanomyces in an oak foeder – have come thick and fast. And, as of summer 2018/19, the Beechworth brewery has decided to introduce one to its year round lineup. In some ways, adding such a beer – particularly one sitting sub-4 percent ABV – to your core range might seem a pretty radical move, yet we've entered a time in which gently soured, farmhouse-inspired beers sitting around mid-strength territory are creeping into such places. And, when you can achieve so much character within them, why not? Here, Table Beer pours that cloudy, almost Bellini cocktail like colour that's becoming ever more common, with a little funk on the nose but more in the way of ripe mango, pineapple and paw paw, presumably from both yeast and the local hop varieties in the mix. There's a gently drying tang underpinning things in a release whose success will be an interesting barometer for the growth of sour beer styles in Australia.